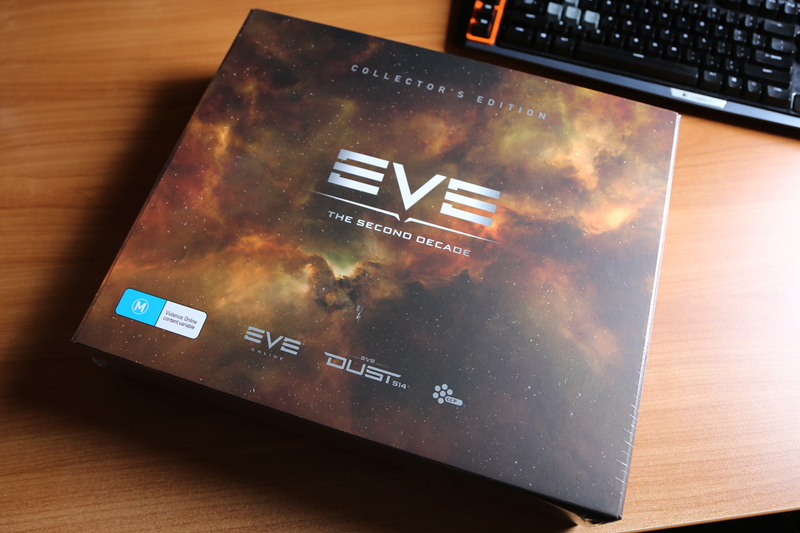 It took a little longer to reach the shores of Australia, but my Collector’s Edition arrived today. As I’ve remarked on before, this purchase was mostly to acknowledge the long time I have spent playing this game. I was particularly keen on getting the book, which looks great, and on first review does a great job outlining the history of the game so far. As I flipped through I kept having “Oh, I remember that” moments. The Rifter model was more flimsy than I expected and a little roughly put together. I’ve put it on my bookcase where it looks much better from a distance. I redeemed the various digital items – implanted the not so Golden Pod on my Main Toon, stored the collector’s items away, and put a handful of items that I am never going to use up on the market. Now I’m listening to the CD. Recently a player somewhat well known for having around 100 accounts lost 14B ISK worth of Mackninaw and Pods to a smartbombing gank. I’ve seen his fleet a few times in my travels – with a mix of horror and awe. This thread was one of many started by an observer, with page 8 showing the result. An “EVE” type thing. I went away for the weekend with the family, so aside updating market orders there was not much done in EVE or Dust. 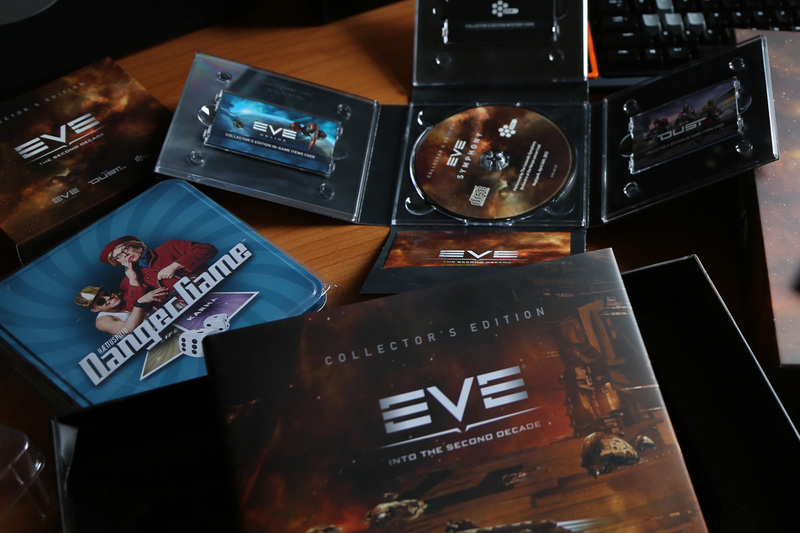 I received notification 10 days ago that my EVE Collector’s Edition had shipped. That was unexpectedly early, and dare I say it, even a touch exciting. Within 17 hours it had been picked up, moved through a couple parcel centers, and processed ready for transportation from Germany to Australia. Since then the tracking details have remained unchanged, so I am still waiting for my not so golden Pod. I now have the week off – and while I will mostly be tackling a ridiculously long To-Do List, I hope to spend some time in and around EVE. I logged into Dust again – you seem to get rewarded for doing that daily. I wasn’t interested in joining a battle – I had set myself just one goal. Find some skills to train. I read a few forum and blog posts about what I should start focusing on first. I can’t say I was left particularly confident with any of the suggestions. Why advise a player to get to rank 5 on one particular skill ASAP? Surely there are a dozen other core skills which you should aim to get to rank 3 or 4 before getting your first rank 5 skill? That seemed to be tone of the advice – it wasn’t really about what new players should do, it was what a min/max player should do on their second or third dust toon. If I found something that seemed to make sense, the comment section was full of conflicting advice. So what was the first problem I had to address? I was dying too quickly in game to get a chance to work out the controls. Answer? Try to improve my tank. While there are core skills to increase your shield and armour, they influence the base statistics of your drop suit in small incremental lots. I had very little ISK to play around with, so the best bang for my training buck at this point seemed to be just to wear a heavier dropsuit with more HP. ISK and SP spent, I can now wear medium dropsuits. I purchased a small number of them and used the rather inaccurate feeling fitting window to set up some Militia gear load outs. By my calculation I have a couple battles worth of these fit outs which – if I dual tank, give me about double the HP I had in my first battle. I should last 4 seconds instead of 2, which might just let me learn a little more. However – dual tanking. Is that as horrible in Dust as it is in EVE? Do people look or scan your fitting, or see it on a killboard, and laugh loudly while quickly putting you on their ban list? Or can you get away with this while you are fumbling around trying to learn things? For a couple of years I caught up with a bunch of work colleagues for LAN days. We probably had a dozen such sessions, which occurred more than a decade ago. The only title I can remember we played with certainty was Halo, but there were others of the same genre. The days were generally amusing, but I wasn’t really a fan of FPS. I was no good in close range where I had to be moving around erratically – but I was normally effective enough at longer ranges where I was either stationary or moving in a constant direction and just having to give appropriate lead. Today I downloaded and installed Dust 514 on my PS3. I’m not entirely sure why. I had recently read a suggestion that even if you don’t play, you should create a character just to start the passive training. To be honest the catalyst was more likely me doubling my monthly quota with my ISP and having lots of extra capacity to do so. Regardless the reason, for the very first time in my life I played an Online FPS today. Actually, let me rephrase that. I spent a period of time with a deep frown on my face being confused and dying half a dozen times before being disconnected and putting the controller down feeling most unsatisfied. The game had an EVE like feel to it, and I got the basic concepts fine. I didn’t train anything, I didn’t buy anything, and I didn’t play around with fits. I just looked through all the menu options to get an overview of what was there, and then I follow the client suggestion to look for a battle. I’ve never played a FPS on the PS3 before, so had no idea what the standard buttons would do. What I wanted was some sort of tutorial in combat / moving around / shooting. Just an empty training ground where I could practice with the basic mechanics of the game. There didn’t seem to be that option, and one miss-clicked button later I was being asked to select a location to deploy. Visually the game seemed ok and responded ok. I could generally work out where the enemies were, although not really the objectives. I struggled with the coordination of the movement and aim – and know that is going to take me a long time to improve. I didn’t try a second battle – I’m just not the sort of person who likes to be a burden on others. I just left my character doing its passive learning thing. I got a Call of Duty game with the PS3 – so am contemplating installing that in the hope it gives me some familiarity with the PS3 controller and using it to shoot things. There are a couple ways of getting this information. I grabbed mine from EVEMon. Just go to Tools > API Tester…, and select the API Method “AccountStatus”. It reports the number of times the characters on an account have logged in, and for how many minutes in total.